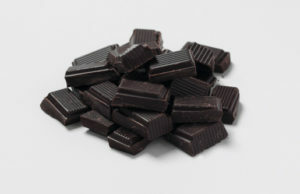 Dark Chocolate has received a great deal of attention because it’s believed to help protect your cardiovascular system. The reason being is that the cocoa bean is rich in a class of plant nutrients called flavonoids. Higher grades of dark chocolate are where you will find an abundance of flavonoids. Nutrition – If the dark chocolate you are eating has a high cocoa content it will also have a sufficient amount of soluble fiber and will be rich with minerals. Antioxidants – Dark chocolate is loaded with organic compounds that are biologically active and function as antioxidants, such as polyphenols, flavanols and catechins to name a few. Blood Flow and Hypertension – The bioactive compounds in cocoa have been known to improve blood flow in the arteries and cause a small but significant decrease in blood pressure. Heart Disease – Eating dark chocolate has shown to be beneficial in improving several important risk factors for heart disease, reducing insulin resistance, increase high density lipoprotein (HDL or “good” cholesterol) and decreasing low density lipoprotein (LDL or “bad” cholesterol). These reductions could show decrease in cardiovascular disease. Be careful about the type of dark chocolate you choose: chewy caramel-marshmallow-nut-covered dark chocolate is by no means a heart-healthy food option. Watch out for those extra ingredients that can add lots of extra fat and calories. There is currently no established serving size of dark chocolate to help you reap the cardiovascular benefits it may offer, and more research is needed in this area. So, for now, it is recommended that a moderate portion of chocolate (e.g., 1 ounce) a few times per week is sufficient while eating other flavonoid-rich foods (lettuce, almonds, strawberries, celery oranges, etc.). Even though there is evidence that eating dark chocolate can provide health benefits, it doesn’t mean you should over indulge. It is still loaded with calories and easy to overeat.